Please submit a detailed CV, covering letter, and other material (e.g., paper(s), teaching evaluations), clearly indicating the position you are applying for. Tech savvy with relevant experience. Taking care of the students of the institute. Responsible for smooth and time to time service / support to students. Command over writing reply via email and Microsoft office packages. Responsible for weekly, monthly reports. Managing Student Queries, Co-ordination with various dept. Taking care of the RBA issues & concerns. Responsible for smooth and time to time service / support to RBA. Managing RBA Queries, Co-ordination with various dept. MBA with 2 years of relevant experience. Candidate would be providing support to RBA. Candidate would be responsible in generating admissions. Making cold-calls to the prospective students. Follow the daily schedule of the tele-calling and submit report to the immediate superior. Note down the alternate date / time to call given by the persons called, and make the call at the given time. Maintain a log book for making follow-up calls to the interested persons at a pre-determined date / time, and ensure to call them at the specified times. Identify areas for improvement and continually make improvement in the quality of calls. Prepare record of number of calls made and call to conversion ratio and ensure achievement of target both in terms of quantity as well as quality. Find out ways to increase call to conversion ratio and discuss the same with the immediate superior before implementation. Remain self-motivated and target driven. Submit weekly activity report to immediate superior. The ideal candidate will have experience in tele-calling and direct sales and able to work independently with minimum supervision. Good communication skill and clear diction is a prerequisite. Politeness, patience, perseverance and courtesy are essential qualities for the candidates. She/he should be a quick learner and should understand consumer needs of the ‘distance education’. The person should be able to handle objections of the prospects to their satisfaction, and ‘close sales’ effectively. Result oriented individual with demonstrated capability of achieving continual success, having zeal and enthusiasm and commitment need apply. A good academic background and a minimum of 1-2 years of experience in tele-calling and sales, preferably in the service industry, is a must. Experience in ‘distance education’ will be advantageous, but not a must. 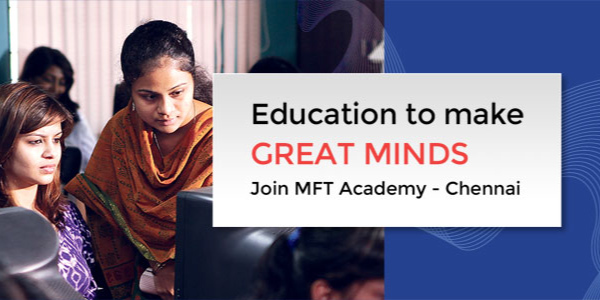 Anyone who requires additional information may call 9841093593 during regular office hours of 9:30 a.m. to 6:00 p.m.
MFT Academy welcomes all applications corresponding to All Career Opportunities and thank you for your interest. We will contact only the applicants whom we wish to interview.